This is the forex visual orders tool & forex position size (lot) calculator with intuitive panel. If you want to place orders easier, faster and more intuitive? If you like to mark trade entry and exit points on charts? If you need to control the risk of each forex transaction? This tool is suitable for you! Forex Risk Reward Ratio Indicator for MetaTrader platform makes your trading easy and professional. It performs all necessary calcualtions for you and allow to control your trades. Thanks to this you can make decisions about trades faster and more consciously. This indicator save your time. Trade like a pro with the best fx tools. Using the Risk Reward Ratio for the MetaTrader platform, you will be able to estimate the risk of each transaction opened on the forex market. Thanks to this forex tool, you can check the risk to reward ratio of each planned trade and exactly check the size of your potential profit and possible loss in the account currency. 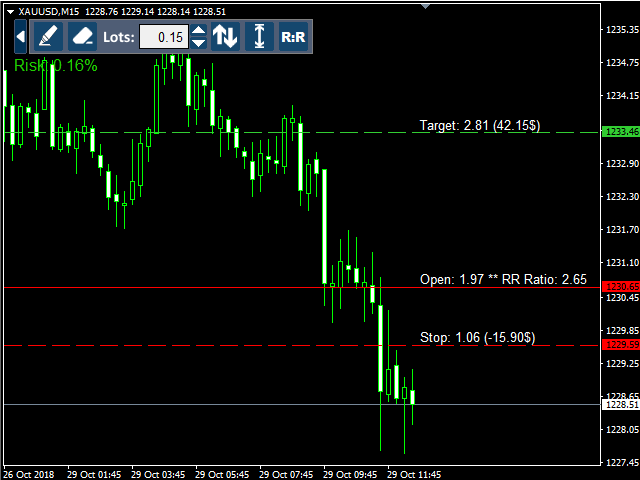 You can also use this indicator as a forex lot size calculator. 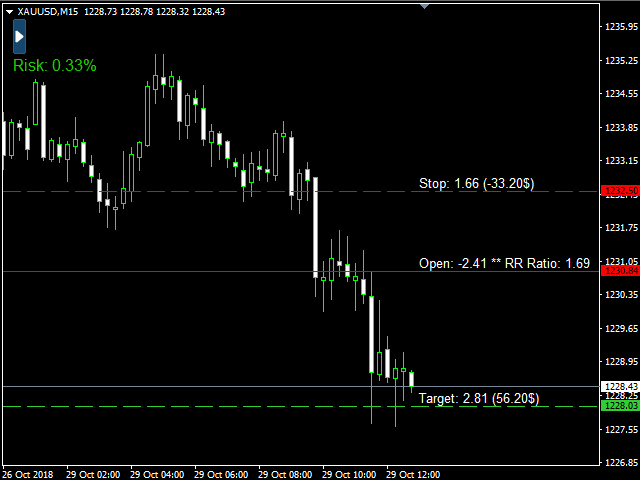 In the indicator's parameters, set the maximum percentage of capital that you can lose on a single transaction. Then, move stop loss line on the chart to set trade exit level on the loss and indicator will automatically calculate the lot size. Thanks to this indicator you will never have to manually calculate lot size saving a lot of time. Using the Risk Reward Ratio Indicator, you will be aware of risks of forex trading and placing orders will be quick and easy. click the draw button (with pencil) and then click on the chart where you want to place the „Open” line. double click on lines and move them to specified levels where you planned to open order and set stop loss and take profit. if FixedRisk = true, then the indicator will calculate the lot size automatically depending on the selected risk (the AllowedRiskPercent parameter) and stop loss distance. run RRR_SendPendingOrder or RRR_SendOrder script to place/open order (all scripts are available to download in "Comments" tab). click button clear (with rubber) to remove lines from chart. Risk Reward Ratio – fixed or default Risk Reward Ratio. If you push „R:R” button on panel, than indicator will keep lines’ distance with selected ratio. AllowedRiskPercent – acceptable risk of single transaction according to account balance (allowed values from 0.1 to 100). Cash Amount - stop loss value as fixed cash amount set in "Cash Amount"
Prefix & Suffix - sometimes indicator must read price of other symbol to properly calculate current pair or CFD profit and loss in currency. In some cases, pairs have additional prefix and/or suffix, e.g. “EURUSD.Pro”. In this case you should write “. Pro” into suffix field. HorizontalAlign – panel can be horizontally aligned to left/right border or center. YDistance – distance in px from top. This indicator is essential for my trading. In fact, this indicator is similar to the one my course coach uses, it saves time and is essential for proper money management. Thanks! Brilliant indicator. Being able to visually set your TP and SL and know precisely what RR you are getting is critical to good money management. And the new features, including the ability to set the Risk as a fixed dollar amount, are just excellent. This is a fantastic indicator and I use it extensively on all of my trading accounts, across both MT4 and MT5. Highly recommended! Although a simple little indicator, I find the best ones are! This helps with setting stops and targets and makes sure that you are on the right side of risk reward. Simple to use. I use this all the time. Thanks. - changed rounding number rule in lot calculation. Now lots are always rounding down to not exceed allowed risk. - solve issue with symbols chars encoding for Mac computers. - new option to keep fixed risk reward ratio.